Cisco 890 Series Integrated Services Routers are fixed-configuration routers that provide collaborative business solutions for secure voice and data communications to enterprise small branch offices (Figure 2). They are designed to deliver secure broadband, Metro Ethernet, wireless LAN (WLAN) connectivity, and business continuity. The routers also come with powerful management tools, such as the web-based Cisco Configuration Professional configuration management tool, which simplifies setup and deployment. Centralized management capabilities give network managers visibility and control of the network configurations at the remote site. Cisco 890 Series Routers deliver high performance with integrated security and threat defense. Network security has become a fundamental building block of any network, and Cisco routers play an important role in embedding security at the customer's access edge. Cisco recognizes this requirement, so Cisco 890 Series Routers are equipped with security hardware acceleration and Cisco IOS Software (by default, a universal image with Advanced IP Services feature license). This Cisco IOS Software feature set facilitates hardware-based IPsec encryption on the motherboard and provides a robust array of security capabilities such as Cisco IOS Firewall, content filtering, IPS support, IPsec VPNs (DES, 3DES, and AES), SSL VPN, tunnel-less Group Encrypted Transport VPN, DMVPN, Easy VPN server and client support, Secure Shell (SSH) Protocol Version 2.0, and Simple Network Management Protocol (SNMP) in one solution set. Cisco IOS Content Filtering uses an innovative website caching and rating architecture to deliver the scalability and flexibility of an enterprise-class filtering solution at a breakthrough price point (Figure 3). This solution is scalable and easy to maintain, and is ideally suited for small businesses and enterprise small branch offices. Cisco 890 Series Routers come with a comprehensive security solution that protects organizations' networks from known and new Internet vulnerabilities and attacks while improving employee productivity. Cisco 890 Series Routers are ideal for service provider deployments as Metro Ethernet customer premises equipment (CPE). Cisco 891 and 892 Integrated Services Routers include two onboard WAN interfaces, one Gigabit Ethernet WAN port with an RJ-45 connector and a SFP socket (Cisco 892F only), and one Fast Ethernet WAN port to support the high-bandwidth demands of Metro Ethernet deployments. The router also provides failover protection and load balancing. The 8-port managed switch provides enough LAN ports for connecting multiple devices, and the optional PoE capability can supply power to IP phones or other devices. The Cisco 890 Series provides significant value to customers by simplifying deployment of Ethernet WAN services with end-to-end OAM, SLA monitoring and verification, and configuration management, resulting in increased operational efficiency and reduced operating expenses (OpEx). Cisco 890 Series Routers enable customers to deliver high-performance, high-availability, mission-critical business applications (Figure 5). The Cisco IOS Software universal image with Advanced IP Services feature license (default) offers basic and advanced routing capabilities to deliver failover protection and load balancing. These capabilities include Virtual Router Redundancy Protocol (VRRP) (RFC 2338), Hot Standby Router Protocol (HSRP), Multigroup HSRP (MHSRP), and dial backup with external modem through a virtual auxiliary port. 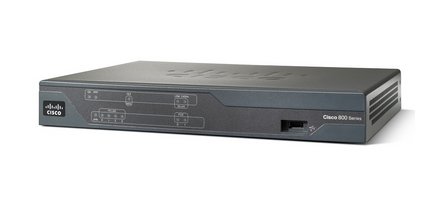 Cisco 890 Series Routers are integrated with ISDN BRI (892 model) or a V.92 analog modem (891 model) for a secondary WAN backup connection. If the primary Ethernet-access WAN is disconnected, the router detects this failure and fails over to the secondary backup WAN. The Cisco 890 Series is ideal for enterprise small branch offices and small businesses that need to be connected to larger enterprise networks. These routers help extend corporate networks to secure remote sites while giving users access to the same applications found in a corporate office. They provide increased reliability for diversity of wireless data, voice, and video applications. When users require WLAN access, visibility and control of network security are even more critical at the remote site. The Cisco 890 Series meets this need with a single device that combines integrated 802.11a/g/n capabilities with security features such as Wi-Fi Protected Access (WPA), including authentication with IEEE 802.1X with Cisco Extensible Authentication Protocol (LEAP) and Protected EAP (PEAP), and encryption with WPA Temporal Key Integrity Protocol (TKIP). The Cisco 890 Series wireless models that include the integrated access point have full feature parity with the Cisco AironetÂ® 1250 Series Access Point and can be used in either autonomous or Cisco Unified WLAN modes. In Cisco Unified WLAN mode, as part of an enterprise WLAN architecture, all WLAN functions are centrally managed through Cisco Wireless LAN Controllers and the Cisco Wireless Control System (WCS). Cisco 890 Series Routers support a whole suite of management tools to provide ease of use. Tools such as Cisco Configuration Professional use smart wizards and task-based tutorials, which resellers and customers can use to quickly and easily deploy, configure, and monitor a Cisco access router without requiring knowledge of the Cisco IOS Software command-line interface (CLI).